Alloy 600 (UNS N06600) is a nickel-chromium alloy designed for use from cryogenic to elevated temperatures in the range of 2000°F (1093°C). Alloy 600 is non-magnetic and readily weldable. The alloy is used in a variety of corrosion resisting applications. The high nickel content of Alloy 600 provides a level of resistance to reducing environments, while the chromium content of the material provides resistance to weaker oxidizing environments. The high nickel content of the material provides exceptional resistance to chloride stress corrosion cracking. A Versatile Nickel-Chromium-Iron Alloy Possessing a Unique Combination of High Temperature Resistance up to 2000°F (1093°C) and Excellent Corrosion Resistance. Alloy 600 (UNS N06600) is a versatile nickel-chromium-iron alloy that be utilized in temperatures ranging from cryogenic up to 2000°F (1093°C) and for corrosion resistant service. The high nickel content assures the alloy will be virtually immune to chloride-ion stress corrosion cracking while also providing corrosion resistance to many organic and inorganic compounds. The chromium content provides resistance to oxidizing environments at high temperatures or in corrosive media, it also resists sulfur compounds. In high temperature service, Alloy 600 resists oxidation and scaling up to 2000°F (1093°C). It is well suited for applications requiring carburization resistance or in sulfur containing environments at moderate temperatures. However, it is subject to sulfidation at high temperatures. Alloy 600 is non-magnetic and cannot be hardened by heat treatment, only by cold working. It can be easily welded and processed by standard shop fabrication practices. Alloy 600 has moderate resistance to strongly oxidizing acids. However, oxidation occurring in dissolved air alone is not sufficient to insure complete passivity and freedom from attack by air-saturated mineral acids and certain concentrated organic acids. Alloy 600 is used extensively in the thermal processing industry where resistance to oxidation and furnace atmospheres is required. The alloy is also utilized in nitriding applications because of its resistance to nitrogen at high temperatures. 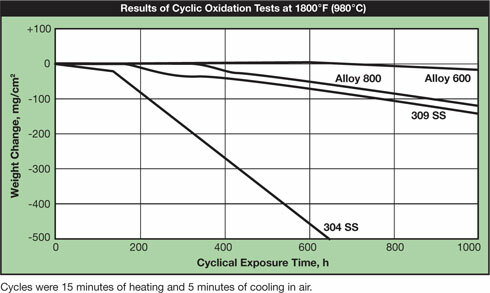 The alloy’s resistance to oxidation and scaling at 1800°F (980°C) is shown in the chart below. Alloy 600 also has good resistance to carburization per the results of tests in a high temperature carburizing atmosphere. *Atmosphere also conatined 5% argon. Alloy 600 can be used in sulfur compound service at moderate temperatures, but it is prone to sulfidation in high temperature, sulfur containing atmospheres. Alloy 600 can be easily welded and processed by standard shop fabrication practices. The alloy cannot be hardened by heat treatment, only by cold working. The hot-working temperature range for Alloy 600 is 1600 – 2250°F (870 – 1230°C). Heavy working needs to occur between 1900 – 2250°F (1040 – 1230°C), while lighter working can take place down to 1600°F (870°C). 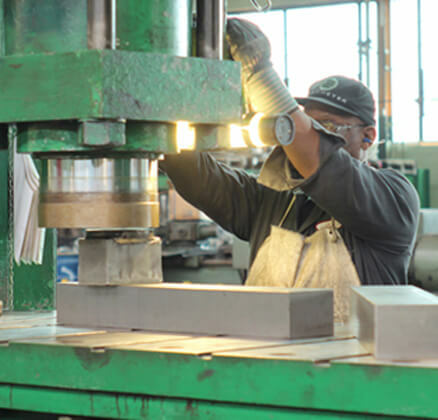 The ductility of the alloy is adversely impacted at temperatures between 1200 – 1600°F (650 – 870°C) making it necessary to avoid hot working in this temperature range. High tensile properties can be obtained by careful working at temperatures below 1200°F (650°C). Alloy 600 can be cold-formed by the standard shop fabrication practices used carbon and stainless steel. Work hardening rates are greater than mild steel, but less than those of 304. Alloy 600 can be readily welded by most standard processes including GTAW (TIG), PLASMA, GMAW (MIG/MAG) and SMAW (MMA). A post weld heat treatment is not necessary. Brushing with a stainless steel wire brush after welding will remove the heat tint and produce a surface area that does not require additional pickling. The machinability of Alloy 600 is slightly better than 304, but not as good as 303 free-machining stainless steel. It should preferably be machined in the annealed condition. Since Alloy 600 is prone to work–hardening, only low cutting speeds should be used and the cutting tool should be engaged at all times. Adequate cut depth is necessary to assure avoiding contact with the previously formed work-hardened zone.